It's Saturday and time for your SOOC (straight out of camera) shots! 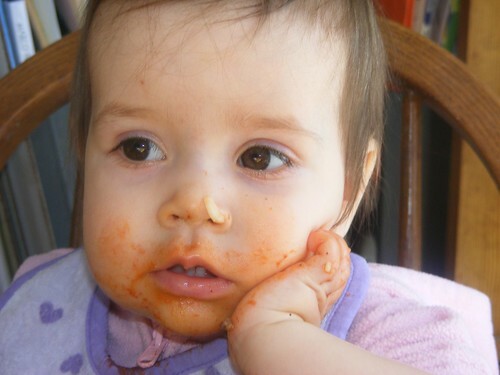 Sarah was eating goulash for lunch yesterday and got just a little messy! Then she leaned her head on her head and it was so cute! I just had to snap a picture! Visit Melody at Slurping Life for more great shots! She has some lovely big brown eyes in this picture too! Love the noodle on the nose. Very Cute! Sarah is my kinda gal...enjoy the food. I, too, love the noodle accent on the nose...precious face. She is beautiful even with goulash on her face. Yay, goulash! Love her face. Oh she is precious!!! What a great capture...looks like all that eating has worn her out :-) Love her eyes! That's a beautiful dirty face! I remember those meals. Too cute! Lunch looks good too! Aww, she made me laugh! Adorable! Love her little pose - how priceless!